Sexting is exchanging sexual messages, photos or videos by text message, social media or email. Some people sext as a way to flirt, to be close to someone without risking pregnancy or a sexually transmitted disease (STD) or simply because they are curious. Some people may think sexting is harmless, but nothing we send on our phones or online is private, including text messages, emails or direct messages. 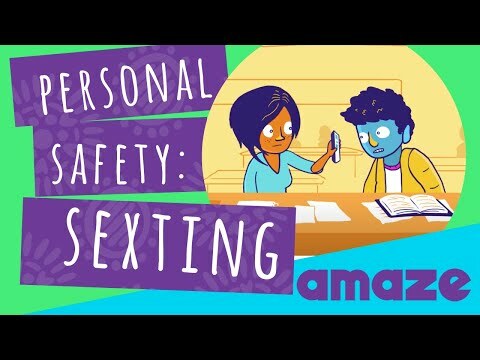 Once you send a sexual message, it could be shared with other people without your knowledge or permission. Forwarding a sexual message you receive or posting a screenshot of a sext online may also be illegal in your state if the message contains a photo of a young person. Considering how risky it is to send sexual messages, never pressure anyone to send you a sext. If someone is pressuring you to send a sext, remember that it is okay to say “No.” If someone sends you a sext, do not share it with friends or classmates. If you receive an unwanted sext that makes you feel uncomfortable, ask the person not to send any more sexts. Talk with a trusted adult if the person continues to sext you. It’s normal to have sexual thoughts and feelings and to want to express your attraction for another person. While sexting may seem like a safe and easy way to do that, it is important to consider all the possible consequences before deciding to send a sexual text message.